In the United States, more than 1.2 million people are living with HIV. Nearly 1,000 individuals in Chicago are diagnosed with HIV each year. Due to the substantial burden of HIV and the sustained epidemic, new interventions are constantly being developed and implemented. The optimal current model of prevention combines behavioral interventions (e.g., evidence-based interventions [EBIs]) with biomedical interventions (e.g., pre-exposure prophylaxis [PrEP]). However, community-based organizations (CBOs) who have strong ties to affected communities and have historically delivered behavioral interventions rarely have the capacity to provide PrEP; alternatively, health centers and hospitals who prescribe PrEP often lack staff needed to conduct a behavioral intervention. Therefore, the model of HIV prevention has been increasingly moving toward complementary partnerships to provide a holistic intervention. In Chicago, the Evaluation Center was funded by the Chicago Department of Public Health (CDPH) to oversee the evaluation and implementation of 20 HIV prevention demonstration projects. These interventions include HIV-positive and negative individuals, include both EBIs and homegrown interventions, and are being implemented within a diverse array of sites. In 2015 and 2016, the Evaluation Center administered a network survey to each grantee in order to capture information on formal and informal connections across over 70 organizations. For this study, a formal connection was defined by having a memorandum of understanding, subcontract, or grant partnership in place. In 2015, grantees identified a total of 201 partnerships, with a median of 11 partners (interquartile range [IQR] = 13). In 2016, a similar median number of partners (10.5; IQR = 13) was named. Although the number of overall partners remained nearly the same, the number of formal partnerships nearly doubled, from 49 (24.4%) in 2015 to 73 (33.2%) in 2016. This change is striking, as 68.8% said that the current HIV prevention landscape was extremely competitive, but only 18.8% said it was extremely collaborative. Despite a competitive environment in Chicago, partnerships between HIV prevention organizations continue to thrive. Although CBOs still tend to be less connected to other organizations, new ties were formed during the year span due partially to the release of new funding opportunities that encouraged partnership formation and partially in preparation for the new model of HIV prevention funding in Chicago for 2018 that requires strong interdisciplinary partnerships. 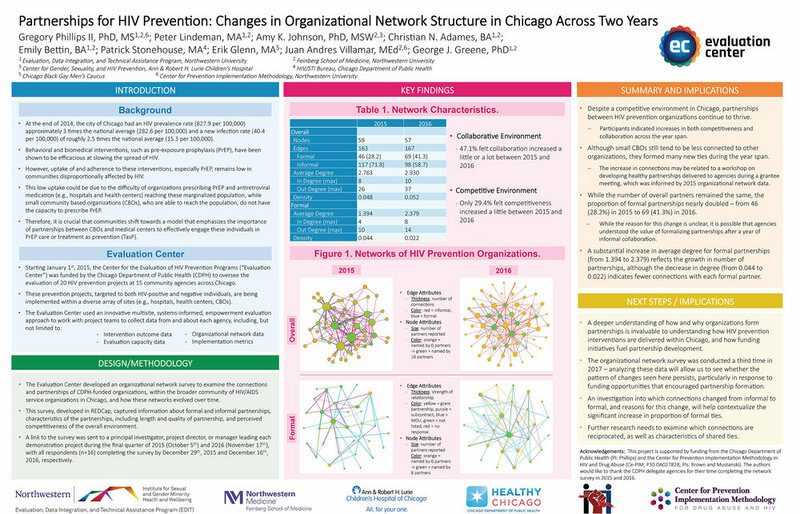 A deeper understanding of how and why organizations form partnerships is invaluable to understanding how HIV prevention interventions are delivered within Chicago.